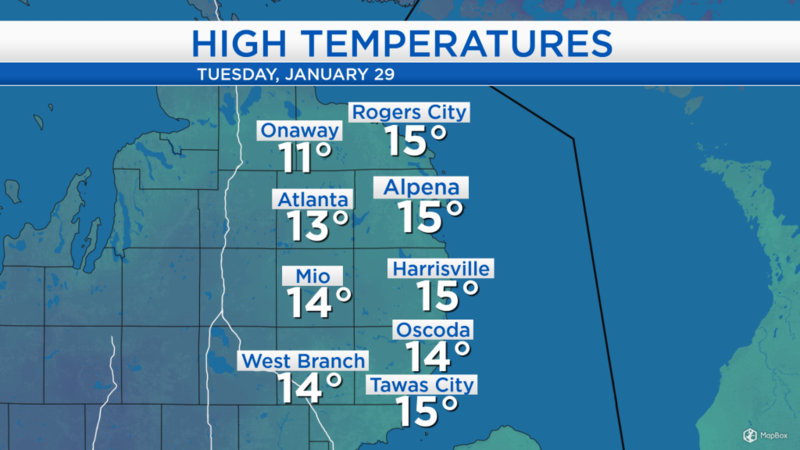 High temperatures today reached the mid-teens under overcast skies and a breeze out of the southwest about 10 mph. High temperatures will drop a few degrees over the next two days, then temperatures will warm significantly going into the weekend. Overnight, temperatures will drop several degrees below 0 — combined with wind speeds of 10-15 mph, that will produce wind chill values in the -20s and -30s. 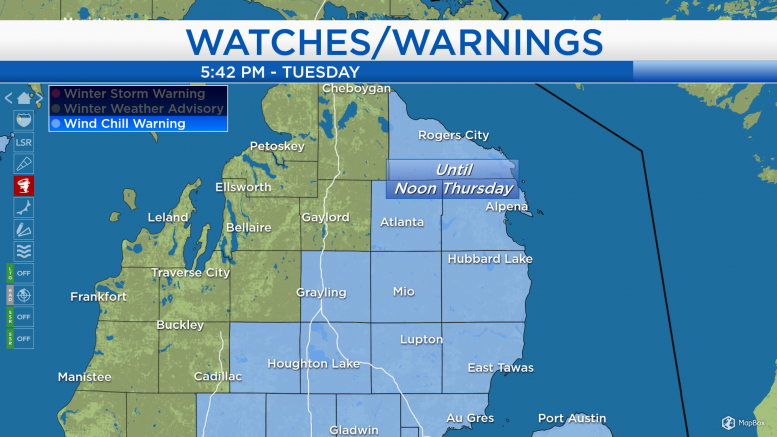 The National Weather Service has issued a Wind Chill Warning including all of Northeast Michigan, lasting until Thursday at noon. The coldest periods will be this evening-Wednesday morning, then Wednesday evening-Thursday morning. Looking back to yesterday’s snowstorm, several locations picked up around a foot of fresh accumulations, including West Branch and Alpena. 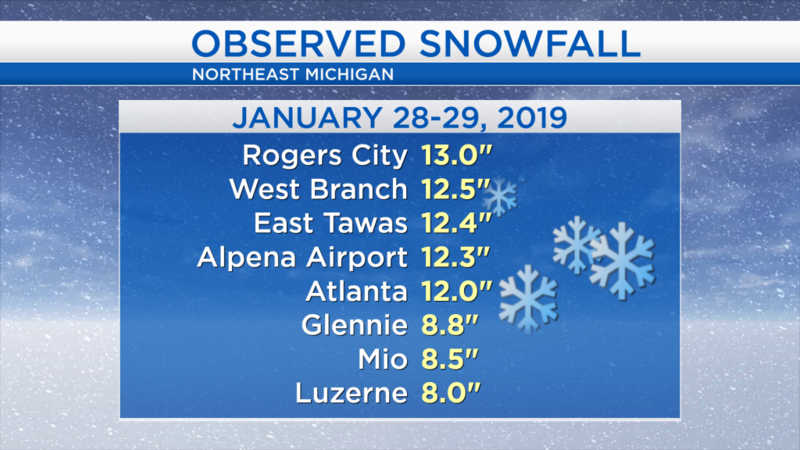 Also, 11.8 inches of snow were measured prior to midnight throughout January 28 near Alpena Airport — setting a new record for snowfall on that date, beating the old record of 8 inches on January 28, 1949. An additional half-inch of snow fell after midnight, producing a total of 12.3 inches. Over the next 24 hours, lake effect snow off of Lake Michigan will cause more snowfall accumulations to the west of I-75. On our side of the state, a few light snow showers are possible tomorrow, not amounting to much. Then dry weather currently over the Upper Plains will move into our area from Thursday until Saturday midday. For tomorrow, dress for wind chill values in the -20s during the morning. Temperatures will remain cold all day as highs reach around 5 degrees with a chance of light snow showers. However, wind chill values around -10 are expected in the afternoon with winds out of the west about 15 mph. For the next couple of nights, low temperatures will drop well below 0 degrees. 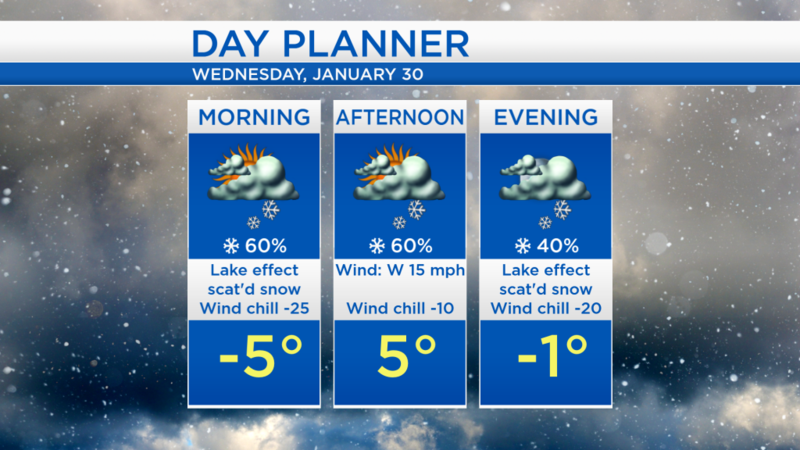 Early Thursday, expect lows around -6 degrees with wind chills in the -20s, then highs reaching 8 degrees under mostly cloudy skies. Some improvement will come on Friday as afternoon temperatures reach the teens under partly cloudy skies. Temperatures will warm into the upper 20s on Saturday with a chance of snow showers developing late in the day. A wintry mix including some rain is possible on Sunday as temperatures climb into the upper 30s. For the rest of Northeast Michigan’s weather forecast, watch the latest weather video by clicking the weather tab at the top of the page.